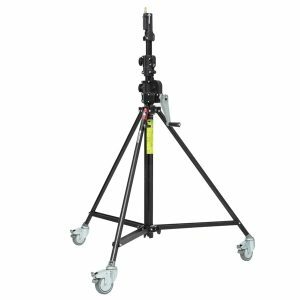 The Manfrotto Wind-Up Stand is a 3.7m tall chrome-plated steel stand with geared column and one leveling leg. Rugged and heavy duty, it combines the strength, stability and portability that is required by today’s demanding professionals. Like all Bogen cine-style stands, it features a Universal Mount which has both a 1-1/8″ Junior and 5/8″ Baby receiver as well as a 5/8″ stud.